To understand how false news -- especially “fake” political news -- spreads, MIT Media Lab researchers Soroush Vosoughi, Deb Roy and Sinan Aral analyzed spread across Twitter between 2006 and 2017. Their findings, which were published in the March 9 edition of Science Magazine, conclude that falsehood diffuses faster than truth. 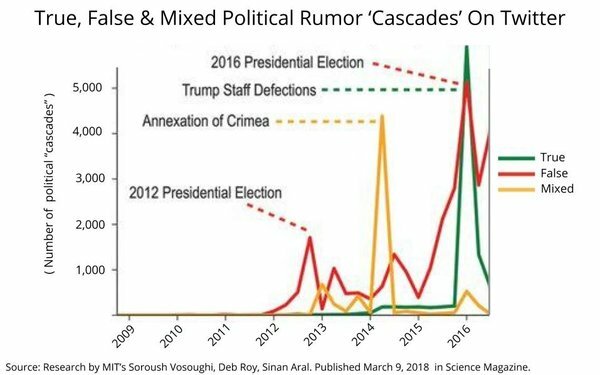 The chart above, delineates recent patterns of true, false and mixed rumors during Presidential news cycles. 3 comments about "MIT Researchers: 'Lies Spread Faster Than Truth'". Mark Scott from Sage Projections, March 12, 2018 at 1:38 p.m.
We needed MIT to do a study on this? I guess if you don't learn from history we are going to just keep relearning the same lessons. Mark Scott from Sage Projections, March 12, 2018 at 1:40 p.m.
Did we really need an MIT study tolearn this? That was over 100 years ago. Paula Lynn from Who Else Unlimited replied, March 12, 2018 at 8:39 p.m. They don't learn. They don't learn. They don't learn.